This again is my mom’s recipe & style, well no actually my dad’s! He would happily grill these for us while mom looked after other chores, in those days a husband cooking or even making a cup of tea, was a very welcome change in an Indian household. So some very special memories attached to this recipe! V like as a snack with drinks sometimes, I like it both ways. 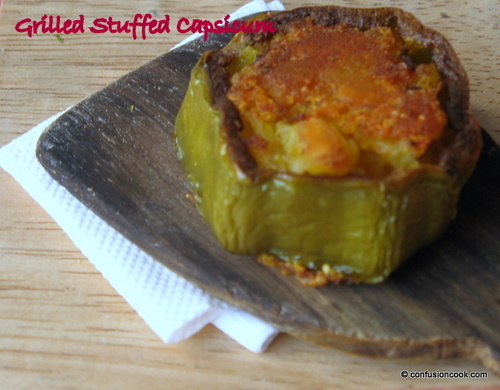 Carefully remove the core from capsicums, leaving the shell intact. Slice them about 1/2″ thick rings. In a separate bowl, break down the boiled potatoes using your hand. Add in spices & green chilli. Mix well. I prefer the chunky bites of potato in this. If you like finer, you can grate the potatoes. 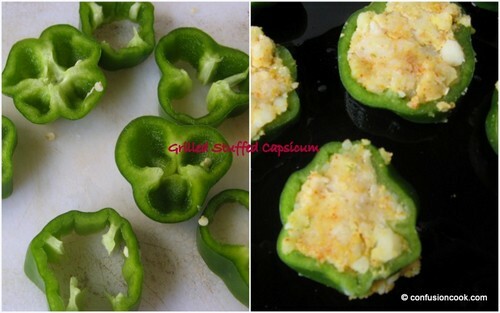 Now place a capsicum ring on your palm and then using the other hand, press the potato filling in each capsicum ring. Do not be afraid and try to press in as much filling as you can without breaking the ring. Upon grilling, capsicum will loose its firmness slightly & if the filling is not compact then it might come off during the process. Repeat this for all rings. Heat a large gridle and spread 1 Tbsp oil. Carefully place all the prepared rings on the hot gridle leaving space between rings to turn around them later. Now grill them on slow fire for about 15-20 mins. Using a flat spatula, turn them around gently for the other side to grill. You can add more oil at this point if you want. Again allow it grill on slow for another 10-15 mins. 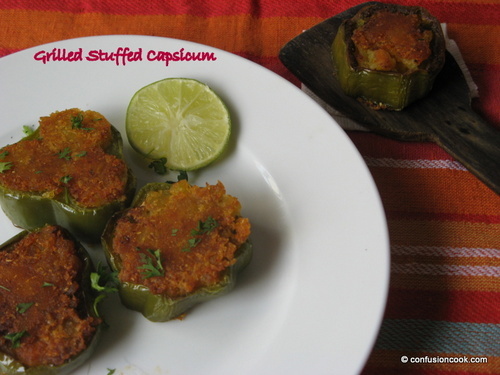 Once done, remove on a platter and serve hot with paranthas or Indian flat bread. Sending this to Color Me Green photography series by Priya.